ExpressVPN — is one of the first VPNs I ever used so it’s been a while, and I still use it when I need a really fast connection. But obviously every VPN has it’s pros and cons, to which ExpressVPN is no exception. Without further ado, let’s get down to the nitty-gritty to see for what one of the world’s favorite VPNs is good for and what not — enjoy the 2019 review. First importance is to understand the target audience and who the service is most suitable for. The devision seems quite clear. Extremely easy to use connection clients across all your devices. Huge amount of server locations to unblock locations restrictions for streaming video and unblocking websites from anywhere in the world. Blazing fast speeds and solid, unlimited bandwidth infrastructure. Strong security with a good level of privacy that you can rely on to protect your activities on the internet. Quality low latency gaming and suitability for torrents, downloading. High-end VPN services with fast, quality support. Advanced security methods such as multiple server hopping. Paranoid level privacy and anonymity to take every measure possible in protecting your identity. Detailed, technical descriptions of service operations for accurate evaluation and security assessment by yourself. Tech-savvy, security professional level support. Secondly it’s good to understand where they stand in comparison with other main stream VPN providers. And I have no doubt that they are on the upper high-end scale of the VPN spectrum. Easier than others — Originally VPN providers were meant for the technically experienced type and this problem still haunts many services. ExpressVPN has been one of the leaders in changing this by bringing services to anyone. And now even the tech-savvy like to keep it simple for convenience sake. More expensive than others — Everything comes with a price tag, however, there are just too many overly cheap providers that put your security at risk and have poor performance. This makes ExpressVPN look expensive when in fact compared to what you get it actually isn’t. Faster than others — Server optimization and good support is the biggest work that needs to be done to run a good business. In comparison, ExpressVPN is a safe bet with speed although you need to try it to be absolutely sure. Logging policy is better but not best – Many providers log user activity. And while ExpressVPN has zero logging of traffic, they do temporarily store the connections you make to the server – which is true for pretty much all main stream VPNs. But because you are on a shared IP address it is very difficult to link the activity to a certain specific user. Next — let’s go more in depth to look at what to expect. Quick registration and instant setup. Fast reply to all support queries – live chat or email ticket. Strictly no logging of Browsing history, Traffic data or DNS queries. Huge Network in more than 87 countries, 136 servers in total. Easy to use and attractive connection client support for all devices and platforms: iPhone, iPad, iOS, Android, Windows, Mac, Linux, Wi-Fi Routers, BlackBerry and more. Connect up to 3 devices at the same time on the same account. Large pool of rotating shared IP addresses – providing a good balance between anonymity and working IP addresses that are not blocked. Unblock websites and stream location restricted video content from anywhere in the world. High-end world wide server infrastructure for premium bandwidth and reduced latency. Great for gaming for example. Easy speed test in connection client to find the fastest possible servers. Thirty day money back guarantee – no questions will be asked. Government strength 256-bit keys encryption – all VPN protocols: OpenVPN, L2TP (IPSec), SSTP, PPTP. Company operates in British Virgin Islands with no data retention laws and loose restrictions on internet privacy. Support for a wide variety of payment options, including anonymous Bitcoin. Credit card (Visa, MasterCard, American Express, Discover, JCB, Visa Electron, Delta, Diners Club), PayPal, Bitcoin, Webmoney, Alipay.com, UnionPay, Giropay, OneCard and many others. Available on the Tor network – making it easy to register and download their client from anywhere in the world. Even from where VPN websites are blocked. For many locations, there are no multiple server locations within the same country. Where another provider could have. Huge popularity increases the chances of having IPs blocked by services that try to prevent people circumventing location restrictions. However ExpressVPN does constantly work to fight this and refresh their IPs. Anonymous registration is not supported. ExpressVPN is renowned by it’s speed and their overly confident slogan on their website stating: “The Fastest VPN on Earth”. The fact of the matter is that speed is highly dependent on not just their infrastructure but your internet connection. Here’s a screenshot of a normal day for me using ExpressVPN. But showing a screenshot of my speed is not going to do much. It’s best to simply subscribe to their service and use the speed tool integrated in the connection client to get an accurate picture of what your speed potential is. The staff response was neither very informative, although it doesn’t mean that their service wouldn’t be on par with what they say. We work with the best data centers across the world that have the best networks and infrastructure. We optimize servers for speed, constantly monitor server performance, and perform load balancing. We do in-house speed tests on servers, improve our apps to perform faster. We don’t have any bandwidth restrictions. So there you have my review.. — hope it was useful! 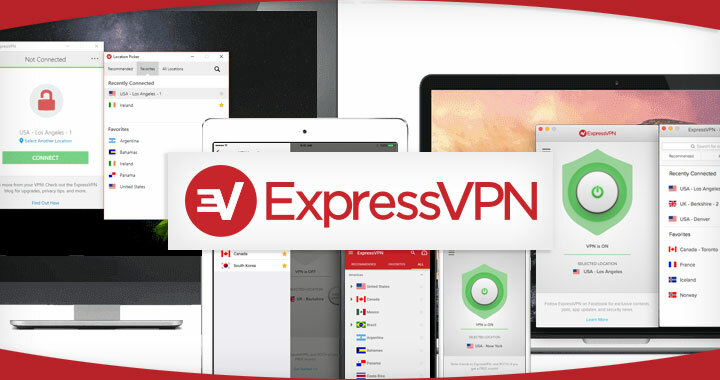 Checkout the ExpressVPN website for more info. What experience, or questions do you have? Please, leave a comment! Nice review. They do seem rather popular!